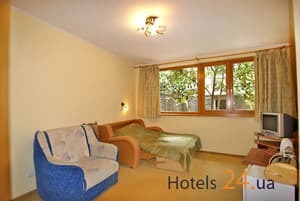 The apartments are located in a quiet central area of ​​Yalta near the sea. The nearest beach is Primorsky, which is located next to the Oreanda Hotel. To the sea - 4-7 minutes walk. Apartment No. 427 is in the private sector. Apartments are equipped with everything necessary for comfortable living: air conditioning, TV, refrigerator, bathroom. Apartments 424 and 426 have an equipped kitchenette. In the apartments № 426 and № 427 there are additional places. There is parking in the street or at home. Near the apartment there are cafes, restaurants, shops. Distance to the bus station in Yalta - 3,4 km; before Simferopol - 83 km. PRICES MAY CHANGE, IT IS REQUIRED TO RECEIVE INFORMATION FROM THE OPERATOR. Description of the room: The apartments are located in the private sector in the city center. On the territory of the house there is a private courtyard, where you can cook barbecue or shish kebab. The apartment has a sofa bed and armchair-bed, air conditioning. There is an electric kettle, refrigerator, necessary utensils. Parking in the street. To the sea 4-7 minutes walk. Accommodation for 2-3 people. Description of the room: The apartments are located in a quiet area a 5-minute walk from the sea. Cozy apartment with a double bed and a sofa bed. Equipped kitchen corner. Large bathroom with bathtub. There is air conditioning, washing machine, necessary utensils. Parking in the street. Accommodation 2-4 people. Description of the room: The apartments are located in the center of the city in an ecologically clean area. 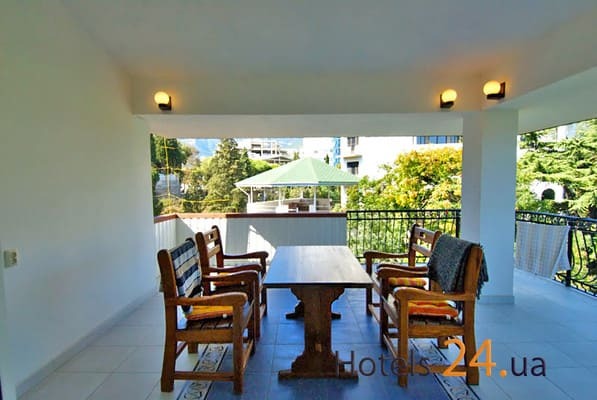 One-room apartment with a beautiful outdoor balcony overlooking the mountains. The total area of ​​38 sq.m, balcony 12 sq.m, bathroom 6 sq.m. A spacious bright room with a double bed, air conditioning, TV, crockery, kitchenette, bathroom. In the bathroom there is a washing machine. To the sea and the embankment 5-7 minutes walk. Parking on the territory of the house. In the center of Yalta, next to the Seaside beach. To the sea - 4-7 minutes walk. Distance to the bus station in Yalta - 3,4 km; to Simferopol - 83 km.